The Save Our Seas Shark Education Centre’s newest exhibit is live and enables visitors to experience the marine realm from a shark’s point of view. Eleanor Yeld Hutchings explains what went into the creation of the world’s first Shark Senses VR exhibit. 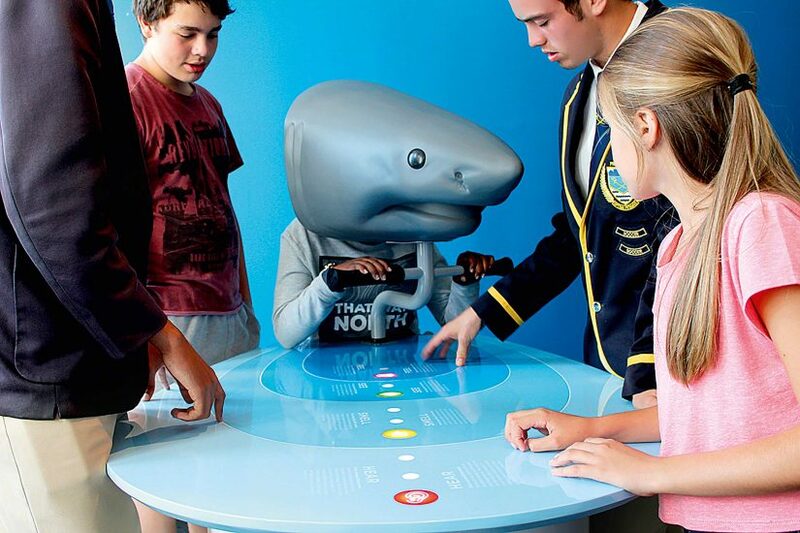 There is an air of extreme concentration in the newly opened ‘Shark Central’ exhibit room in the Shark Education Centre. Silence – broken only by the sounds coming from the 3D model of a shark’s head that, with lights flashing, is mounted above a table. Someone is seated behind the table, their face inside the shark’s head. Standing around the game, a group of spectators follows its progress through the series of lights shining on the table’s surface. And deep inside the virtual reality ocean world, the game player swivels the shark’s head backwards and forwards in an attempt to swim towards the elusive sounds of the fish prey swimming somewhere up ahead. Success! ‘You are several hundred metres away and can now smell your prey,’ the game announces. Now it’s time to follow the scent trail. And on the hunt goes, using the different shark senses one by one as they come into play, before finally – hopefully successfully – coming jaws-to-tail with that tasty tuna. The Save Our Seas Foundation’s Shark Education Centre in Kalk Bay, South Africa, has been upgrading and adding new exhibits for the past two years. The emphasis has been on creating an experience for visitors that is unique, educational and fun, and the brand-new Shark Senses VR exhibit, which uses virtual reality, is part of this. With a wide-ranging audience to consider, but targeting primarily learners aged between eight and 18 years, our intention was to curate an immersive experience that would not only communicate conservation messaging effectively, but also deliver something that was unlike anything the user had ever experienced before. 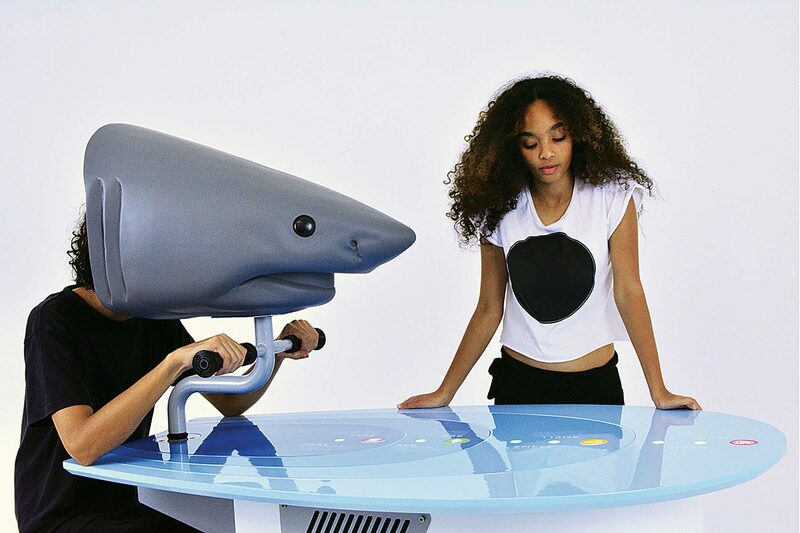 This specific exhibit was commissioned to enable the user to understand at first hand what it feels like to be a shark in search of its prey and to use all the senses that sharks deploy in their hunts, which are different and more powerful than the senses that people use every day. From the start we wanted to be able to position the user inside a model of a shark’s head and allow them to see through the eyes of the shark. The question was, how to transform that idea into an exhibit in reality? That’s where Formula D Interactive came in. 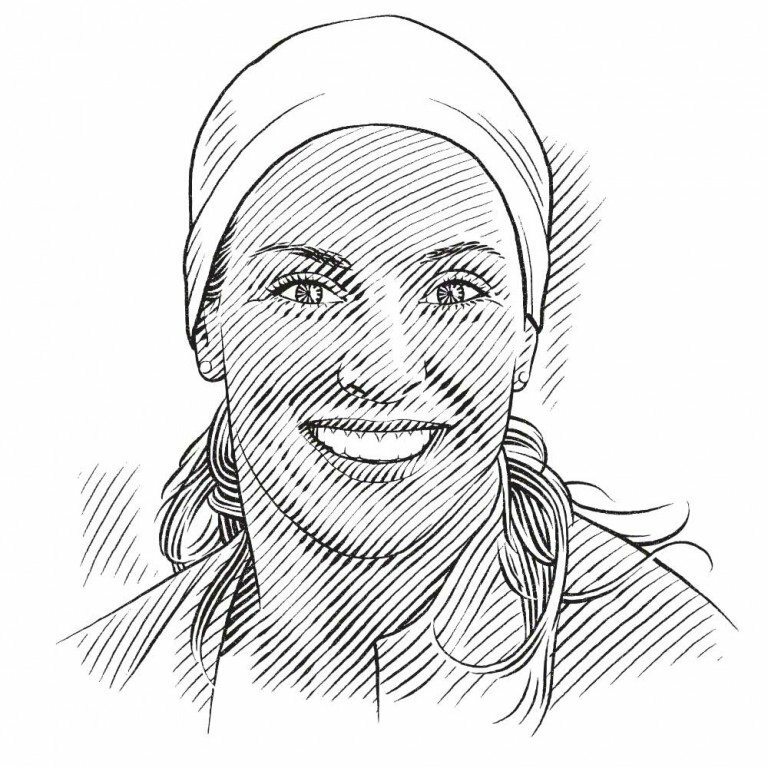 The redesign process of the Shark Education Centre is a collaborative project between the education centre and interpretation specialist Heidi De Maine from Sunfish Consulting. Having worked with Formula D Interactive on other projects, Heidi recommended that we take our idea to them. And, as the Shark Education Centre is based in Kalk Bay, we felt that it was important to use a local design agency so that both parties could collaborate in the creative process and share input throughout. The fact that it was logistically easier to deliver hardware and service the exhibit also played a role. In the end, however, the choice came down to the fact that Formula D Interactive offered real creativity, innovation and quality – plus a host of experience – and was willing to take on a project concept as challenging as this and make it work with us. Education is changing; it has moved on from being only books, pencils and pens, and our brand of environmental and marine education has to keep up with these changes. Although the classroom will always have a role to play and experiential field learning will always be indispensable, more and more we are seeing that technology is opening up whole new pathways of learning that resonate with young people in a way that our traditional methods just can’t. Today’s generation of school-goers is both computer literate and game savvy and can interact intuitively with the exhibits. 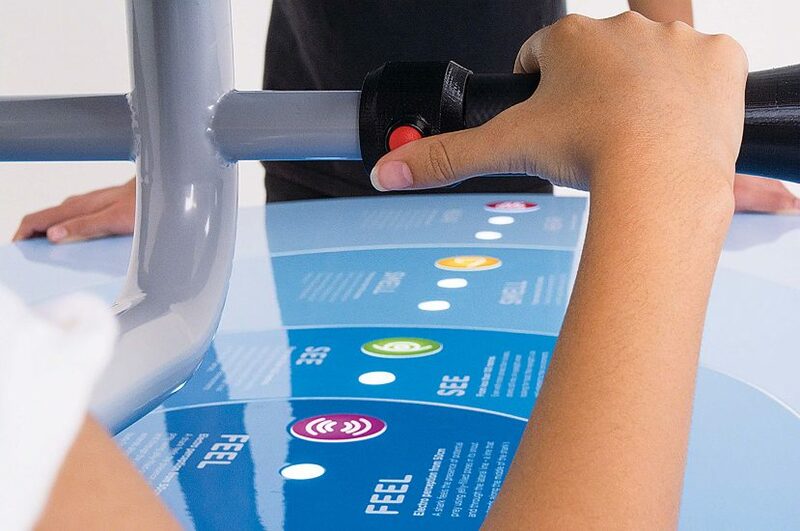 We need to take advantage of this and make sure that we are offering cutting-edge interactive displays that engage our visitors and also deliver our messaging. The pedagogies of constructivism and game-based learning show that children learn by doing or by being and that game-based learning provides engagement and motivation as key factors. Virtual reality offers such a wonderful opportunity for this: there really is no better way to understand something than to experience it for yourself! So far, the feedback we have been getting on the Shark Senses VR Exhibit has been wonderful. The exhibit is very different from anything else on offer, anywhere in the world, and this, together with the immersive user experience with its amazing attention to detail, has really impressed everyone who has used it. It has been awarded an internationally acclaimed 2016 Red Dot Award for Communication Design. We are extremely proud of our one-of-a-kind, cutting-edge interactive and we can’t wait for more people to come and play.